The Java regionMatches method is one of the Java String Method which is used to tell whether this string region matches with the user specified string region or not, and based on the result it will return Boolean True or False. 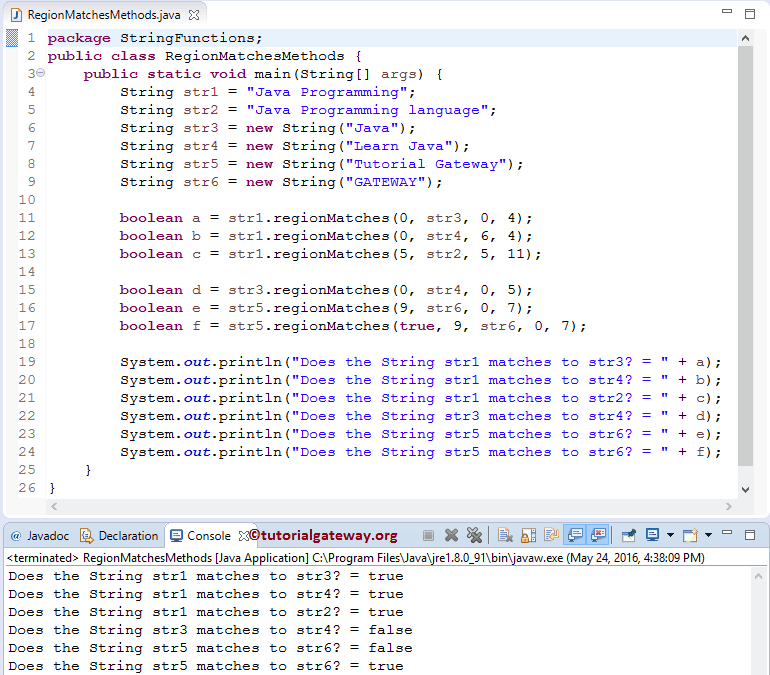 In this article we will show you, How to write string regionMatches in Java Programming language with example. Before we get into the example, let us see the basic syntax of the String.regionMatches in Java Programming language is as shown below. The Java programming language provides two different methods to check regions equality. String_Object: Please specify the valid string object that you want to use in region match. Starting_Index: Please specify the starting index position of the String_Object. If you specify this value as zero then, regionmatches method will match from index position 0 otherwise, it will start matching from the character at specified index position. Other: Please specify the another string object that you want to use in region match. Offset: Please specify the starting index position of the Other. If you specify this value as zero then, regionmatches method will match from index position 0 otherwise, it will start matching from the character at specified index position. Len: Please specify the length of a sub string from Other. IgnoreCase: If you specify TRUE, Java regionMatches method will perform Case-insensitive match otherwise, it will perform Case-Sensitive match. The Java string.regionMatches method is used to check whether two string regions are equal or not. In this Java program, We are going to find the same. Following statement will call the public boolean regionMatches(int Starting_Index, String other, int offset, int len) method to compare the string str1 with str3. From the above screenshot you can observe that, it is returning True. Here String_Object = “Java Programming”, Starting_Index = 0, Other = “Java”, Offset = 0 and length = 4. It means Java = Java, which is true. Following Java regionMatches statement will compare the region of string str5 with str26. Although the strings str5 and str6 are equal, from the above screenshot you can observe that it is returning False. This is because, both str5 and str6 differ in Case. Following statement will call the public boolean regionMatches(boolean ignoreCase, int Starting_Index, String other, int offset, int len) method to compare the string str5 with str6. From the above screenshot you can observe that, it is returning True because this method is performing case-insensitive match. Following statement will ask the user to enter any word, and then we are going to assign the user entered value to string variable str. Next, we used the Java If Else Statement to compare the user entered string region with the String Object “java programs” and check whether they are equal or not. If you observe the below code snippet, we are using both public boolean regionMatches(int Starting_Index, String other, int offset, int len) and public boolean regionMatches(boolean ignoreCase, int Starting_Index, String other, int offset, int len) to makesure that we are performing case-insensitive region match.